Granted, this post could have just been named “I like to eat” and it would be completely accurate, but inexplicably I ADORE eating while walking. Something about food while on the move just makes me happy. I sometimes joke (not really joking) that I could walk forever if you just kept feeding me things. This is why I find it so strange that the Italians generally buy gelato and then stand/sit outside the store and eat it. I supposed they would say they are savoring it. I say, don’t you know you could take that gelato on the road?? Best. walk. ever. 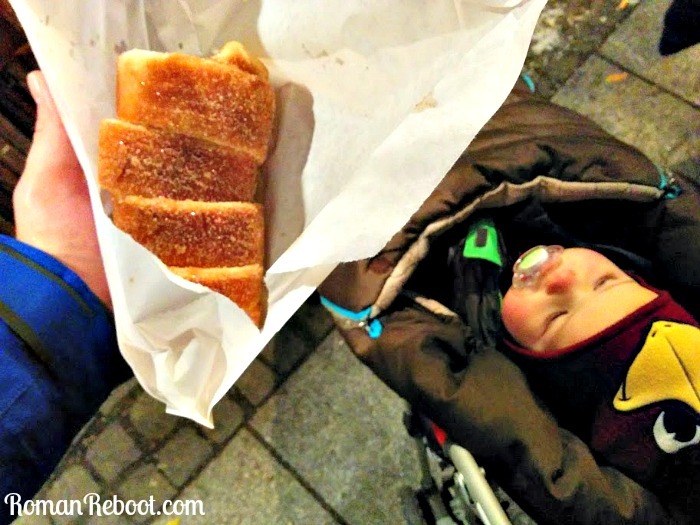 Christmas markets are the perfect spot to indulge in an eat-and-walk. And you can drink-and-walk too! (But we’ll cover drinks later.) It is pretty much the best thing ever. It’s like the state fair, but classier and more festive. Up first, we had plenty of actual meat. Here, you can see me with your standard bratwurst. 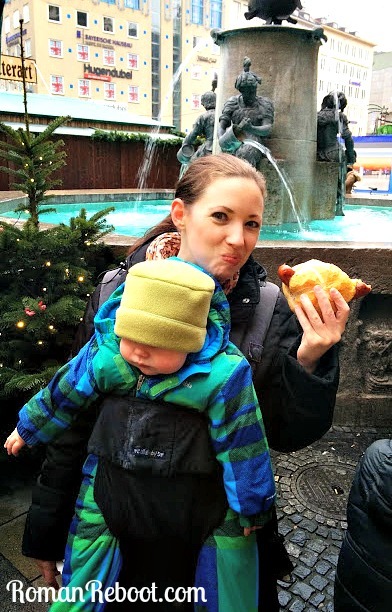 We pretty much avoided the traditional Munich weisswurst, as we are not huge fans. But we did have plenty of currywurst, which is a sliced bratwurst in a tomato curry sauce. 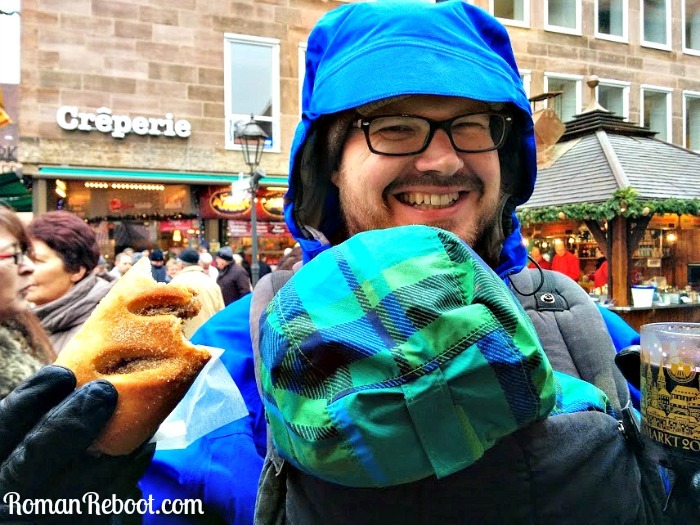 James also discovered a deep love for the Nurnberger bratwurst, which are smaller and served three or five to a roll. As James will tell you, there is more surface area for more crispy skin deliciousness. I thought the Nurnberger ones tasted a tad breakfasty, but very delicious. There were fish sandwich vendors as well, but we never got around to trying it. Up next, the baumstriezel. This was new to me, but it is not one I will soon forget. It is basically just dough that sort of looks like it is cooked on a spit and topped with deliciousness. We tried coconut, but preferred the simple sugar and cinnamon version. Note the bundled toddler. Henry will pretty much stay in the stroller as long as he is getting food. Can’t imagine where he gets it . . .
We didn’t seem to take any pictures, but we also enjoyed french fries, crepes, and roasted almonds (both traditional and nutella-flavored). And probably other things I’m forgetting. You can ask James; I was constantly darting off, a few euro in my pocket and returning with something to eat. It was awesome. Some honorable mentions that we didn’t eat but looked fascinating. 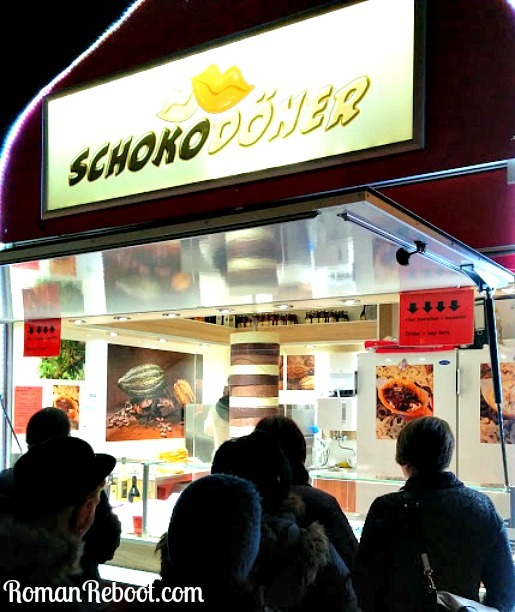 Here, we have the schoko doner. Instead of meat, you can see the pillar of chocolate that was shaved off into various things. And here, middle, you can see the marzipan potatoes. Zee Germans are a little obsessed with marzipan and a lot obsessed with potatoes so I suppose this was inevitable. I like marzipan as a sort of condiment to a dessert item. This is a lot of marzipan. And a special note on lebkuchen. Because you can’t mention a Christmas market and not talk about lebkuchen. You can see some of them dangling in the photo above. They are everywhere. We did try an iced one. They are sort of like gingerbread, but I like them less. James seemed to enjoy it. He brought some for his office and one of his colleagues who lived in Germany before said it took her back. This is true. 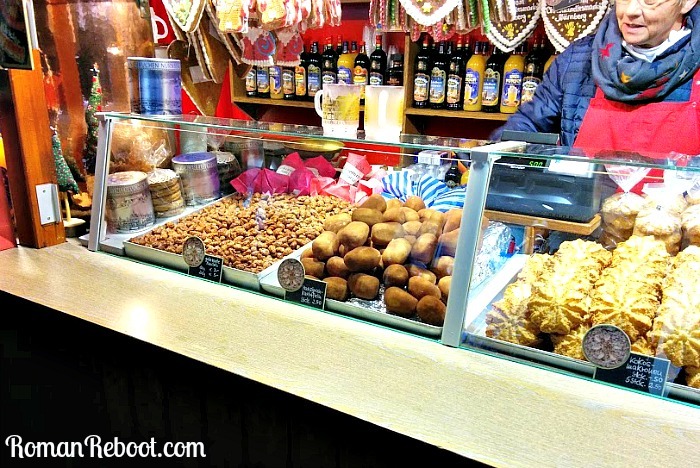 Love it or hate it, lebkuchen = Christmas market. Do you like a walk and eat? I say it’s like a Sorkin walk and talk, only better! Have you tried recreating at home? I may give it a shot, but I know it won’t be as good. Sigh.